If you are American you may never have heard of Enid Blyton, but in Britain she’s a beloved institution. 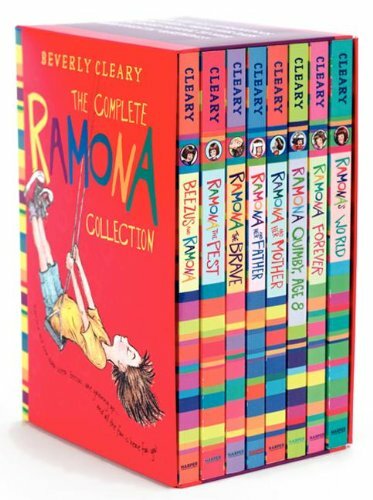 An incredibly prolific writer (she wrote hundreds of books) who wrote primarily in the 1940’s through the 1960’s, her books are wholesome and fun (though at times a little dated). 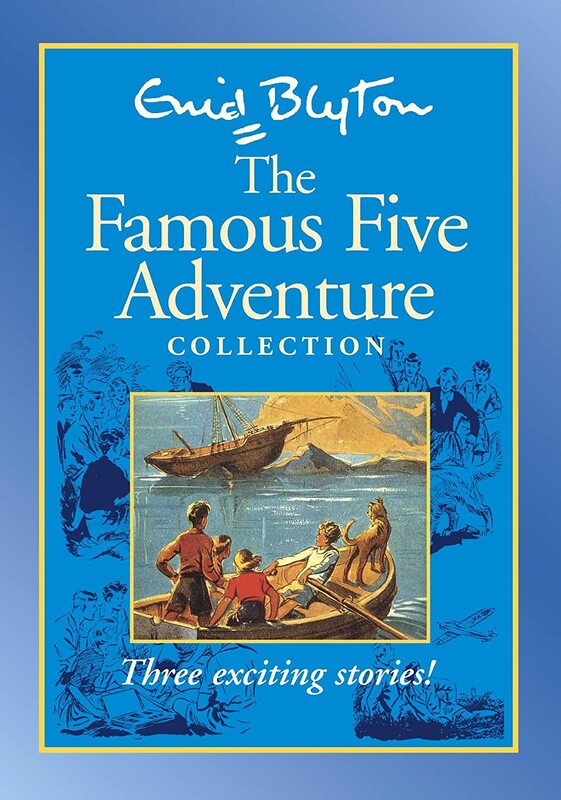 The Famous Five, one of her more famous series (there are 42 Famous Five Books in all! ), is about 4 cousins and their dog solving mysteries on the coast of Cornwall. Although all of the cousins are main characters, the heroine is really George (short for Georgina) – an unabashed tomboy, fearless and outdoorsy. England’s answer to Nancy Drew, for slightly younger readers. The Nuni is also a big fan of the Magic Faraway Tree series (and Mom would like to add that the chapters are nice and short and the perfect length for bedtime reading). Betsy-Tacy tells the story of two best friends who never quarrel, growing up in Deep Valley, Minnesota at the turn of the century. The first book, Betsy-Tacy, begins when the girls are five, and traces their simple adventures – filling bottles with colored sand and selling them, playing paper dolls, and starting school. Later on, they add Tib to form a trio, and the stories are wonderful coming of age stories from a simpler time. They capture childhood perfectly, but also take us back to a different time, when the first car in town is a big deal, when a picnic was a perfect Saturday afternoon activity. What makes them even more fun is that the books track very closely the life of the author, Maud Hart Lovelace, growing up in Mankato, Minnesota. 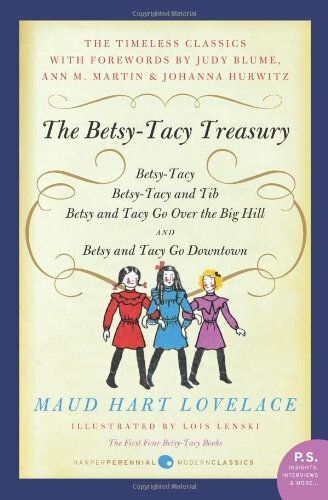 The first four in the series – Betsy-Tacy, Betsy, Tacy and Tib, Betsy-Tacy Go Over the Big Hill and Betsy-Tacy Go Downtown – take the girls through childhood and age twelve, and are perfect for younger readers. There are additional books in the series – starting with Heavens to Betsy and ending with Betsy’s Wedding) — that take Betsy through high school, boys, clubs, heartbreak, and eventually love and marriage. These are absolutely charming as well, and I can’t wait for Nuni to read them (when she’s about ten). 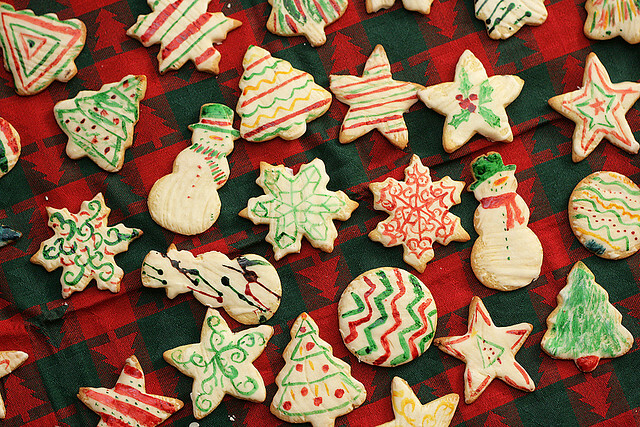 Half Magic by Edward Eager is the first of four books with related characters. The first two – Half Magic and Magic by the Lake – deal with a family of four siblings – Jane, Mark, Katharine and Martha – who have magical adventures that don’t always go as well as they would wish. The second two – the Knight’s Castle and the Thyme Garden – deal with four cousins who happen to be the children of Katharine and Martha, and who also have magical adventures. 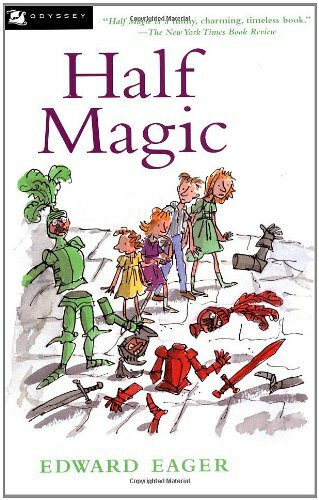 The girls are strong and independent, the books are funny, and the takeaway message is that magic is all very well and good, but old fashioned fun can be a great relief. 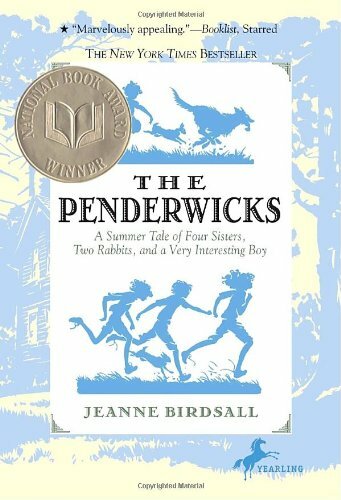 You probably didn’t read the Penderwicks when you were a kid – these books, unlike the others on this list – are of a more recent vintage. But like the other books on this list, they have a timeless feel and are instant classics. The Penderwicks tell the stories of four sisters -Rosalind, Skye, Jane and Batty who live in Massachusetts with their botanist father. Their mother died when Batty was a baby (warning- this plays a major plot point in the second book, and if you have a sensitive or anxious child you might want to skip that one until later), and the sisters take care of each other and stick together through thick and thin (though they also annoy each other – they aren’t paragons of virtue). 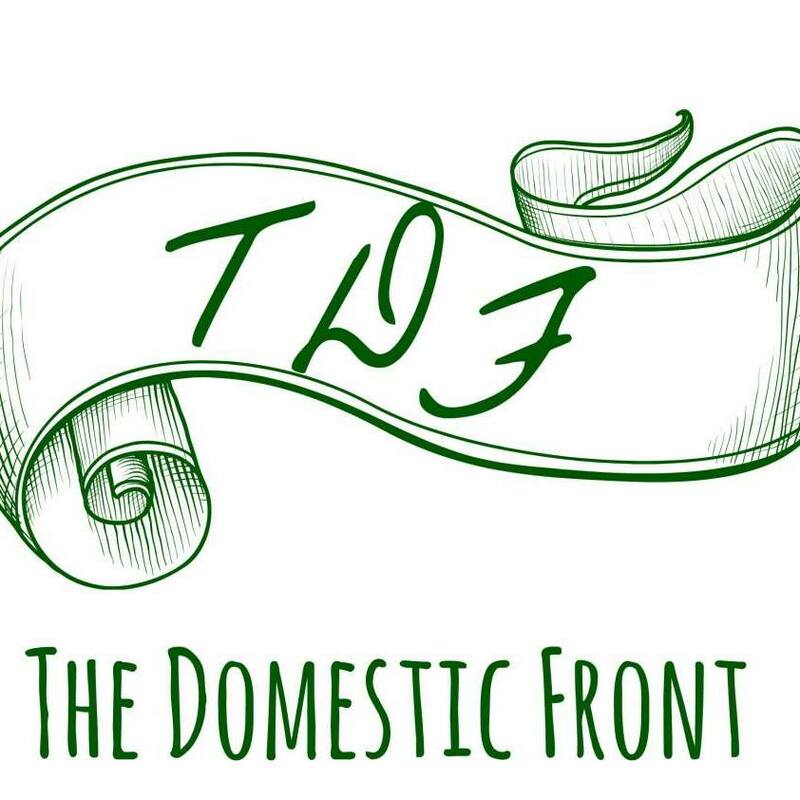 The first and third book takes the family on their annual summer vacation – the first to the Berkshires, the second to Maine (which I fully admit inspired our own trip to Maine last summer), and the second takes place at their home in Cameron (read: Amherst) Massachusetts during the school year. The sisters struggle with rules, relationships, and becoming their best selves. Any girl will be able to find a sympathetic character and a role model – Rosalind is the eldest and the caretaker of the family who is just discovering (innocent) crushes and balancing her own interests with her familial responsibilities. Skye has a hard time controlling her temper, but she is a hard worker and takes refuge in soccer, math and science. Jane has literary ambitions and is a fiend on the soccer field and Batty can sometimes find it easier to get along with animals than with people. The stories are well-paced enough to hold interest without being too scary or exciting for bedtime reading. 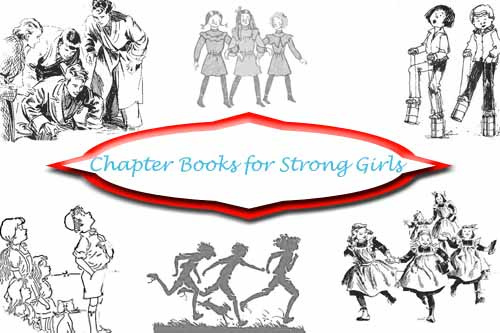 If you’re reading to a mixed gender group, the first and fourth books feature the girls’ friend Jeffrey, who is an ‘honorary Penderwick’ and plays a large role in the plot. I myself am looking forward to the release of the fourth book. 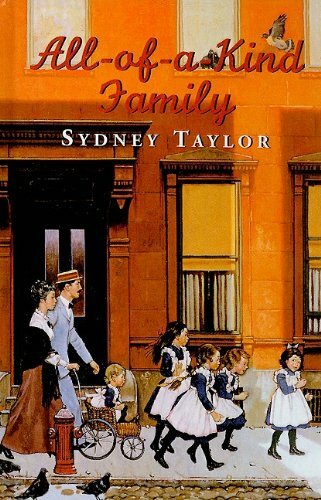 The All-of-a-Kind Family Books tell the story of a family of five sisters living on the lower east side of Manhattan around the turn of the century. 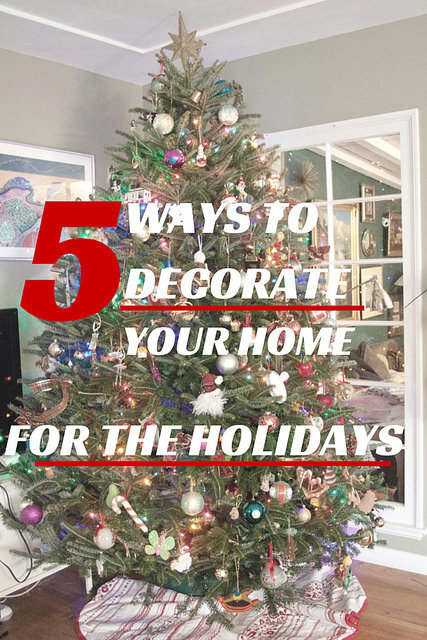 The family is Jewish, and Jewish holidays and traditions play a big role in the books. They are a great lesson in history and culture for any kid (I can say that everything I know about Purim I learned from these books), but they also deal with everyday childhood — Sarah loses a library book, and doesn’t want to spend all her small savings on the replacement costs. Gertie and Charlotte sneak candy in bed and eat it when they think their Mama isn’t looking. Henny gets lost at Coney Island when the family spends the day at the beach. There are some great lessons for children of today (my personal favorite is when Sarah is served her lunchtime soup at every meal until she eats it, since food is expensive and cannot be wasted (The children chant “No soup no meat, no meat no fruit, no fruit no penny!”)) but also a glimpse into a lifestyle and time that may be different from your own (though kids raised in Jewish households will also love hearing about how some of the traditions remain the same today). The books can be hard to find in bookstores, but our local library has them all, and you can often find used copies.